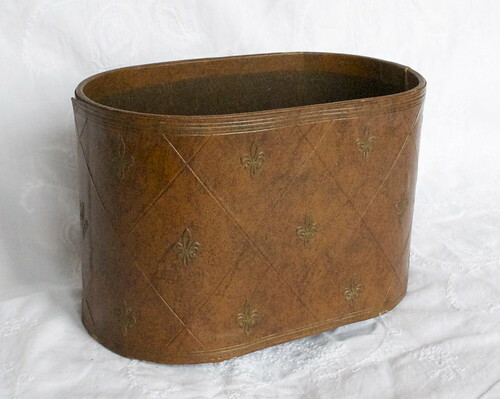 This vintage bin with a Fleur de Lis pattern would make a great home office container for pens and markers or could be used as a remote control holder. It could even be used as a letter/bill holder too. The possibilities are endless! The bin itself is good condition, but the Fleur de Lis faux leather patterned paper that wraps around it is lifting from the bin in certain spots. It could use a little super glue in those spots but once that's taken care of, would be in good condition. And the bottom black covering has also lifted on one side, but could also be glued down. You can purchase this at Shop Proper Hunt, my new Etsy store! Thanks! SOLD!